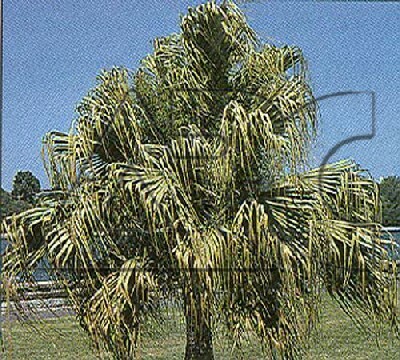 Medium sized palm with an erect, robust trunk swollen at the base, the upper part covered with fibrous leaf bases, at least at first. Glossy, rich green leaves, up to 2m long, with shorter spiny leaf-stalks, are divided for up to two-thirds of their length into many linear, pendent segments. Cream flowers are borne in panicles, up to 1m or more long, usually in summer, followed by ovoid to spherical, glossy, blue-green to gray -pink fruit.